We've adventured with Ed Mouse, the educational mouse, before... and I had a couple of kids who were very, very excited to have the chance to use Time4Learning in our schooling again. We've been using it for about three weeks at this point. Time4Learning is an online, subscription based provider of curriculum for preschool through grade 8. This time around, my kids are in K, 2, 5 and 7 grades, so I could see a pretty wide range. The preschool program is separate, but I reviewed that a couple years ago. I'll go through my kids, one at a time, and talk about their experiences. Katrina is my kindergartner. She LOVED Time4Learning. And... she started actually reading. She's been close to really reading for a month or two, but within a week of starting Time4Learning, she made that jump. The kindergarten program only includes math and language arts, however, since each "grade" also gives you access to the grade above and below, she could access science for 1st (and 2nd?) grades as well. There isn't much there with the science... but she worked through every single available exercise. I was happy with the content... starting with differentiating living things from non-living things, and also including different habitats and sections about the stars. She has worked through just over half of the kindergarten math. This didn't really surprise me, as I was pretty sure she's doing math a bit "ahead" of grade level... I'd have guessed a late kindergarten level, which seems to hold true here. The language arts section has been fantastic for her. She's finished roughly 40% of the kindergarten lessons and finds them to be a lot of fun. Plus she is definitely learning. I've seen a difference. Richard is my 2nd grader. He chose to work mostly at the 1st grade level, which has been fine. He has more options available to him, as there is an "LA Extensions" section, and he can choose social studies. He, however, has chosen to focus on Language Arts (and the LA Extensions). 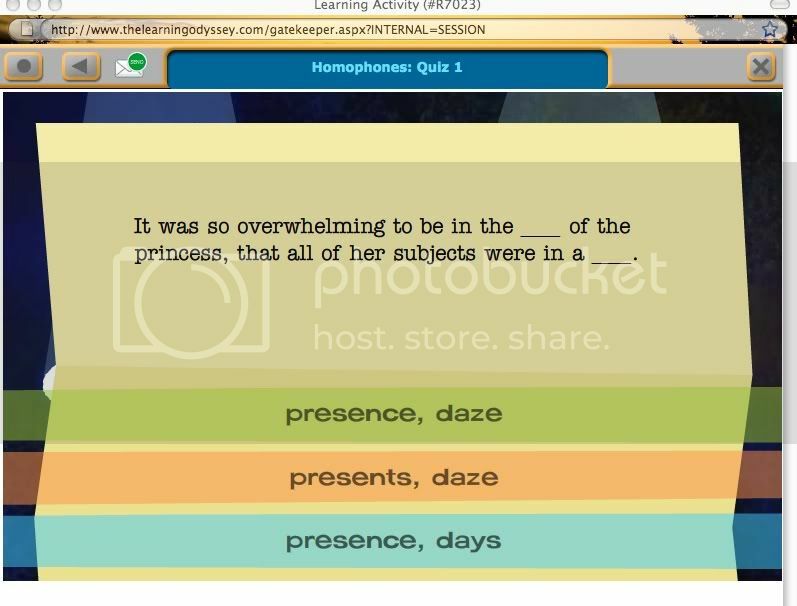 The above screen shot is from one of the LA Extension activities. This one involved constellations. I was pretty impressed with this. He went through getting some exposure to a few individual items (Milky Way, Big Bear, North Star, telescope, etc.) and then worked through a story a few times. These hold his interest because they tend to be non-fiction... so he is learning about something, not just doing some silly reading exercise. That's a big deal for him. I have been thrilled with what he is learning, and his reading has definitely improved. Thomas is my 5th grader. He mostly focused on math, and that has been okay for him. He found the science and social studies fairly frustrating, because of his reading struggles. Too many words. The math though... that has been good. 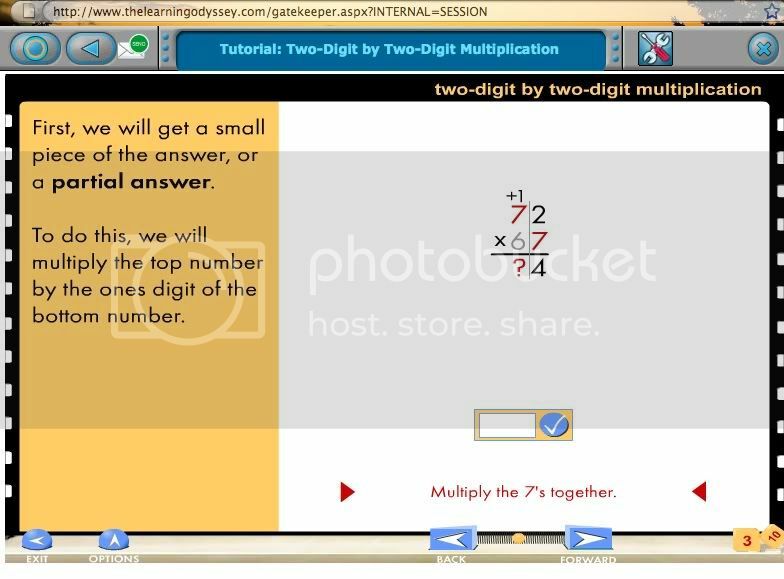 The above, showing multiplication of two 2-digit numbers, clicked for him in a way other things have not. Probably the color differences in the numbers. William is my 7th grader. He's severely dyslexic, and he just found the whole thing a bit frustrating. I couldn't put him at a low enough reading level without him feeling stupid, and he's really just had a lousy month in general... so doing this wasn't high on his list. However, he did really enjoy the vocabulary exercises. This one had him working with homophones. He's now working on the section on idioms. My bottom line? I would love to have Richard and Katrina continue with Time4Learning. I think the early language arts is quite good... and I really like the language arts at the older levels too. The price is what holds me back... at $19.95 per month for the first student, and $14.95 for additional students in the same family, this is out of my family's price range at the moment. The kids are going to be sad to see this end. Disclaimer: As part of the TOS Homeschool Review Crew, I did receive this game in exchange for my review of the product. All opinions are my own, and receiving complimentary products does not factor in to my opinions. For more about my take on reviews, visit my blog post here. Women of Faith - in Denver this weekend! Hunger Action Month: What Can I Do?